ABSTRACT: The issue of “bad declamation” in French opera drew significant critical attention from composers and scholars in the long nineteenth century, with writers such as Castil-Blaze, Saint-Saëns, and d’Indy noting down perceived faults in French text setting. In this article, I examine examples of “mistreated accents” in nineteenth-century French opera, arguing that French composers from Grétry and Auber to Gounod and Bizet often used rhythm and text setting as a way to differentiate between two different kinds of operatic music: non-diegetic music (singing as speech) and diegetic music (singing as song). The diegetic style was also extended to situations where dance and military topics were used to depict characters performing to onstage audiences. I apply this framework to selected excerpts from Bizet’s Carmen in order to examine the part played by contrasting text-setting styles in the construction of that work’s musical drama. In July 1905, a frustrated Richard Strauss, who was working at the time on a French-language version of Salome, asked in a letter to Romain Rolland: “Why do the French sing differently [from] the way they speak?” (Strauss 1968, 36). (1) The issue of “bad declamation” in French opera drew significant critical attention from composers and scholars in the long nineteenth century, with writers such as Castil-Blaze, Saint-Saëns, and d’Indy noting down perceived faults in French text setting by composers such Grétry, Rossini, Auber, and Offenbach. This tradition has persisted to the present day; for example, Susan Youens writes in the Cambridge History of Nineteenth-Century Music that “French opera and song are replete with examples of mistreated tonic accents” (2002, 489). In this article, I examine examples of “mistreated accents” in French operas from the long nineteenth century, spanning the hundred-odd years from Grétry’s Le huron (1768) to Offenbach’s Les contes d’Hoffmann (1881). Building on the work of Carolyn Abbate and Andreas Giger, I argue that French composers from Grétry and Auber to Gounod and Bizet often used rhythm and text setting as a way to differentiate between two different kinds of operatic music: non-diegetic music (singing as speech) and diegetic music (singing as song). The diegetic style was also extended to situations where dance and military topics were used to depict characters performing to onstage audiences. In the final part of the article, I apply this framework to selected excerpts from Bizet’s Carmen (1875) in order to examine the part played by contrasting text-setting styles in the construction of that work’s musical drama. Syllable counting. French verse has a syllabic system of meter, and lines are constituted in regular numbers of syllables. Each pure vowel sound (e.g., la, tout) or diphthong (e.g., rien, lui) is counted as one syllable. Adjacent vowels that are not pronounced as diphthongs are counted as two syllables (e.g., hier, cruel). A special rule in syllable counting in French verse concerns the mute or silent “e” (e muet), which is found at the end of many words. The e muet typically is not pronounced as a separate syllable in regular speech. In musical settings, however, the e muet generally is pronounced and set as a separate syllable, unless it is elided into a following vowel sound. For purposes of syllable counting, the e muet is treated differently depending on where it falls within a line of verse. An e muet at the end of a line is not counted as a separate syllable. If an e muet occurs in the middle of a line, however, it is counted as a separate syllable (unless it is elided into a following vowel sound). In the first line, the e muets at the end of the words “parle” and “autre” are both counted as separate syllables because they occur in the middle of the line and are not followed by words that begin with other vowels. In the second line, by contrast, the e muet at the end of the word “menace” is not counted as a separate syllable because it is elided into the vowel sound of the following word, “ou.”(4) Finally, the e muet at the end of “prière” is pronounced in Bizet’s musical setting, but not included in the syllable count because it falls at the end of the line. Rhyme schemes. Lines may end either on a syllable containing an e muet (traditionally known as a “feminine” ending) or any other vowel sound (a “masculine” ending). There are three basic rhyme schemes for a quatrain, or four-line stanza: rimes embrassées (or abba), rimes croisées (or abab), and rimes plats (or aabb). (6) As a general rule, masculine rhyme-pairs alternate strictly with feminine rhyme-pairs in French verse. In other words, if the a rhyme is masculine, the b rhyme will generally be feminine, and vice versa. Grétry’s interest in “proper” text setting in French opera is reflected in his Mémoires, which first appeared in 1789 and were expanded in 1797. After recounting a conversation he had with Voltaire about text setting, Grétry discusses the proper musical treatment of the e muet by citing an example from one of his earliest successes, Le huron (1768). This is reproduced in Example 1. I have annotated the text using a convention adapted from Andreas Giger and used throughout this article. Accented syllables are bolded and underlined, and parenthetical Arabic numerals after lines of verse refer to the position of accented syllables within the lines. Unless otherwise indicated, all such annotations in this article will indicate accented syllables as if the text were being declaimed or read in the manner suggested by Quicherat’s treatise. In a declamation of the lines from Le huron shown above, a customary tonic accent would appear on the rhyming syllables (on the last counted syllable of each line), and a secondary accent would appear on the fourth syllable of each line, marking the end of a syntactic unit, or word group. In his musical setting of these lines in Le huron, Grétry places the notes carrying tonic accents in metrically strong positions. The tonic accents in the words “canton,” “Huronie,” “Turquie,” and “Arabie” (on the fourth and eighth syllables of each line) are set to higher pitches on downbeats, while the weak e muets in the words “Huronie,” “Turquie,” and “Arabie” are set to lower pitches in metrically weaker positions. The musical setting of Example 1 thus reflects a reasonable approximation of the rhythmic stresses of declaimed verse, from the metrical emphasis on the tonic accents down to the “trailing off” quality of the e muets. The sensitivity to text setting shown by Grétry can also be seen in the work of a composer-theorist from the following generation, Antoine-Joseph Reicha (1770–1836). In 1833, Reicha published a treatise on the art of operatic composition entitled Art du compositeur dramatique, ou Cours complet de composition vocale. Reflecting the importance that Reicha assigned to text setting, the first section of the treatise is devoted to prosody and its relationship to music. In shaping Natalie’s vocal line Reicha followed his own prosodic rules to the letter. Each of the prosodic accents annotated in the text above falls on a notated downbeat, and the variations in accentual patterns in each of the four hemistichs are scrupulously observed. For example, the first phrase begins with an upbeat, allowing the accented syllable “toi” to land on a downbeat. 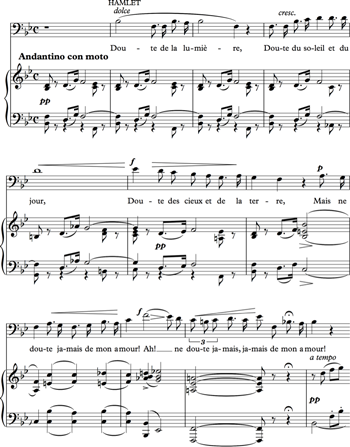 The second phrase starts with a half-note downbeat to reflect the placement of the accented syllable “Dieu” at the beginning of the second line. In addition to receiving metrical emphasis, the accented syllables in Example 2 are further reinforced by longer note values. The irregular rhythmic emphases on accented syllables (especially the elongated “toi” in the opening line) and the irregular combination of syllabic and melismatic text setting result in a melody that is even more asymmetrical than the verse rhythms would otherwise suggest. Examples 1 through 3 trace a consistent approach to text setting in French opera over the hundred years that separated Grétry’s Le huron (1768) from Thomas’s Hamlet (1868). In each of these examples, prosodic accents are consistently aligned with metrical accents in the music. During the same period, however, many French operatic composers, Grétry and Thomas among them, employed an alternate melodic style that featured a much higher degree of conflict between melody and prosody. Rather than following the implied stresses on the third and sixth syllables in the first line, however, Grétry emphasizes alternate even-numbered syllables: the weak e muets at the end of the words “une” and “fièvre” are both rhythmically and melodically emphasized, set to long downbeat notes and higher pitches. The resulting musical declamation (une fièvre brûlante) sounds artificial and forced; in his treatise on musical expression, Mathis Lussy wrote that “it is astonishing that Grétry, whose taste is so refined, could have written such a phrase as this” (1874, 52). (16) Why did the composer so egregiously ignore his own rules of text setting? It would have been easy enough to start the number with two eighth-note upbeats and to put the strong first syllable in “fièvre” on the first downbeat. Alternatively, the librettist Sedaine could easily have written verses that provided a better fit for Grétry’s music. (17) Why were Grétry and Sedaine content to leave the number this way? The key to this puzzle can be found in the dramatic situation reflected in Example 4. In the opera, Richard the Lionheart has been held captive in Austria on his way back from the Crusades. His faithful retainer Blondel the minstrel has been searching for him all over Europe. In the scene from which Example 4 is taken, Blondel plays and sings a tune (“Une fièvre brûlante”) outside Richard’s cell, accompanying himself on the violin. Richard recognizes the tune as his own composition and responds to Blondel, and together they plan for a rescue. In his Mémoires, Grétry noted that unlike most of the other numbers in the opera Example 4 is heard as music not only by the audience in the theater, but by the characters on stage as well. In other words, the number is an example of “diegetic” music (in the language of film studies) or “phenomenal” music (in the formulation of Carolyn Abbate). (18) The scene alternates between music and dialogue in quick succession, with the diegetic character of the music signaled by Richard’s exhortation “écoutons” (listen), which is directed both to himself and to the audience. 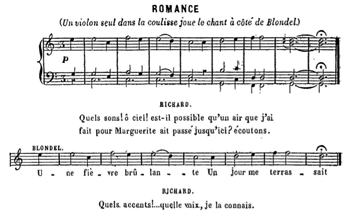 The un-naturalistic text setting of “Une fièvre brûlante” is one of the important stylistic pointers that mark the romance as a diegetic number, in which Blondel sings not to speak, but to sing—“chanter pour chanter,” in Grétry’s formulation. In her book Unsung Voices, Carolyn Abbate argues that diegetic music in opera is often characterized by a “symbolic musical simplicity” (1991, 76). (21) The rhythmic simplicity that characterizes Blondel’s romance, however, comes at a price. In order to achieve it, Grétry had to sacrifice strict adherence to the principles of proper text setting. Example 5. Le Sage, Les eaux de Merlin (1715), Prologue, Air. (a) Text; (b) Melody; and (c) Transcription. As the transcription in Example 5c shows, all four of Le Sage’s six-syllable verses are scanned mechanically in recurring weak–strong patterns, or iambs, when the verses are sung. As a result, all even-numbered syllables, including the e muets at the ends of the words “lorsque” and “tyrannisent,” as well as the first syllable of “punir,” are given metrical and melodic emphasis in exactly the same kind of misaccentuation that we saw in “Une fièvre brûlante” and that we shall see in further examples below. The popular vaudevilles and parodies from the later years of the reign of Louis XIV were written in a “low” style that was intended to contrast, often in a satirical or mocking manner, with the elevated declamatory style of Lully’s tragédies lyriques. Vaudeville melodies like Example 5(b) were typically sung in the carnival atmosphere of the Parisian street fairs and were generally folklike and catchy, often featuring steady, dance-related rhythms (Isherwood 1978, 295–99; Grout 1939, 217). Grétry may very well have been thinking of these earlier popular styles when he said in his Mémoires that “Une fièvre brûlante” was composed in “the old style.”(23) I suggest, then, that the text-setting practices associated with the vaudevilles and related popular entertainments found their way, either intentionally or by osmosis, into the French opéras comiques of the later eighteenth and nineteenth centuries, becoming associated with diegetic numbers in which operatic characters sing to entertain onstage audiences. Table 1. 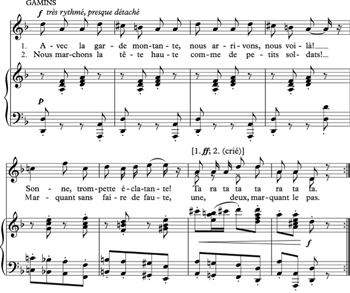 Contrasting Melodic and Text-Setting Styles in French Opera. As simple and attractive as the versification theories of Scoppa and Castil-Blaze might have been, they did not reflect the actual practice of contemporary French librettists. In the third and fourth lines of Example 7, for instance, the internal prosodic accents shift from the second to the third syllable. Composers setting French texts with shifting accents were faced with the choices set forth in Table 1. 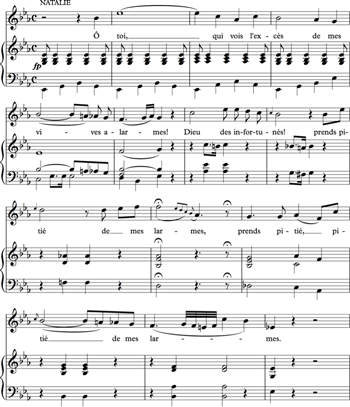 In the barcarolle from Guillaume Tell, Rossini, perhaps with an Italianate concern for correct prosody, chose to adapt the melodic rhythm to the prosodic rhythm: the third and fourth lines (“du plaisir,” etc.) are set to anapestic rhythms (weak–weak–strong) instead of iambic ones (weak–strong). We have seen that rhythmic simplification and regular accentuation of verses was a common feature of diegetic numbers in French opera. 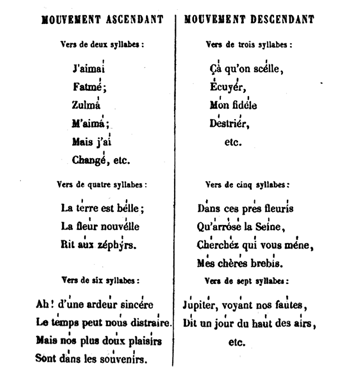 Depending on the actual placement of prosodic accents in the French verses, the resultant musical declamation may be unobjectionable (as in Example 7), but it may also be artificial or perverse (as in Examples 4, 5, and 8). In the latter examples, the practice of setting text to recurrent rhythms with no apparent regard for prosody directly contradicts the text-setting principles outlined by commentators like Grétry, Reicha, Scoppa, and Castil-Blaze. However, Giger (2008, 10–11 and passim) has noted that this particular practice was recommended by the philologist Louis Benlœw in an 1862 treatise on rhythm in French verse. According to Benlœw, the temps forts in a musical setting may coincide with syllabes fortes in the text, and they generally do coincide at points of strong articulation, such as at the caesura and at the line-ending rhyme. Elsewhere in the line, however, prosodic accents and musical accents may simply go their separate ways. An examination of an actual musical setting of Béranger’s song, as published in an 1847 anthology, provides some support for Benlœw’s theory (Example 9). The tonic accents at the caesura and rhyme in each line coincide with downbeats in the music. In addition, each of the other even-numbered syllables in the verses falls on a beat (Benlœw’s temps forts), while the odd-numbered syllables (other than the first syllable of each line) are metrically de-emphasized, falling on eighth notes off the beat. (34) As mentioned above, what I have called the “diegetic” style of text setting had deep historical associations with the vaudevilles and other popular musical styles that pre-dated the opéra comique. 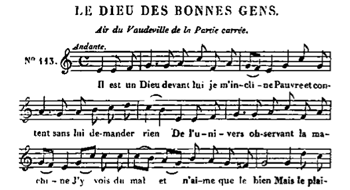 In light of this, it is not surprising that the verses used by Benlœw to illustrate his theory of versification were written to be sung to a vaudeville melody (note the caption “Air du Vaudeville” in Example 9). As with Masaniello’s barcarolle, the chorus sets up Olympia’s number as a diegetic performance, this time with the word “Attention!” immediately before the number begins. Offenbach’s setting emphasizes all the alternate odd-numbered syllables in the seven-syllable verses, resulting in the misaccentuation of the e muet in “l’astre” in the second line. The simplification of the rhythms and the mechanical alternation of stress patterns in the text reflect both the diegetic nature of the number as an actual song performed by a wind-up doll and the mechanized and artificial nature of the performer herself. Halévy’s setting of the first three lines follows the practice suggested by Benlœw and results in differing emphases in accentuation: odd-numbered syllables are accented in the setting of the first and third verses, while even-numbered syllables are accented in the setting of the second. As a result, the first and third syllables of the word “maîtresse” (including the word-ending e muet) are improperly accented from a prosodic perspective. The interjection “Ô” in the second line of the first strophe is an addition in Halévy’s score that was not originally present in Eugène Scribe’s verses, which contain five syllables throughout—see Example 11b. Without this extra interjection, Halévy could easily have set Scribe’s original line (“Maîtresse chérie”) in the same way as the corresponding line in the second strophe (“Heureux et prospère”), or indeed the fourth lines in both strophes (“Le jour du retour”), with a melisma on the stressed second syllable of the line. By introducing the extra syllable “Ô” in the first strophe, the composer went out of his way to introduce a misaccentuation that brings out the singsong, or diegetic, nature of the number. 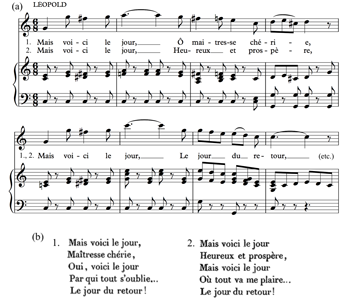 As with Léopold’s serenade from La juive, the serenade of Méphistophélès is set up as a diegetic performance by the orchestral introduction, which imitates the strumming of a guitar or mandolin, and the regular accentuation (or misaccentuation) of alternate syllables in the text. A natural delivery of the third line would be “Ô Catherine ma mie.” In Gounod’s setting, however, Méphistophélès mockingly draws out and misaccentuates the name of the fictional Catherine (the mirror of Marguerite in the opera): “Ô Catherine ma mie.” Note in particular the relative metrical emphasis placed on the e muet at the end of “Catherine” at the expense of the preceding vowel. The perverse text setting underscores the ironic and darkly humorous tone of the song and its diegetic nature. Giger has suggested that scanning the text against some tonic accents (i.e., in the style of Benlœw) was considered perfectly acceptable in nineteenth-century French opera “in arias intended to convey a lighthearted atmosphere or local color” (2008, 122). However, most of the examples above serve a dramatic purpose that goes far beyond the signification of mere lightheartedness or local color. In Richard cœur-de-lion, Blondel’s romance directly sets into motion the recognition and rescue that form the dramatic core of the opera, and the melody itself recurs throughout the opera, providing a unifying thread to the work (Charlton 1986, 247–48). In La muette de Portici, Masaniello’s barcarolle is a “lighthearted” fisherman’s song only at the most superficial level. Its real dramatic significance lies in its encapsulation of the mood of deep political discontent, simmering below the surface of the text, that drives the action of the opera. Hoffmann’s obliviousness to Olympia’s mechanical nature, a quality that is completely obvious to the other characters listening to her aria, is crucial to the drama of that act and emblematic of Hoffmann’s general air of romantic illusion in the opera as a whole. Léopold sings his serenade to Rachel under an assumed identity, and this deception leads directly to the opera’s tragic denouement. Méphistophélès’s serenade shines an ironic mirror on Marguerite’s tragedy and ruin, and its diegetic quality arguably makes us empathize with her situation because we are hearing this grotesque serenade through her ears, as it were. (36) As Luca Zoppelli has written, diegetic music in opera performs multiple dramatic functions, and the provision of lighthearted diversion or couleur locale is only the most superficial, or the “degree zero,” of those functions (1990, 31). It is not surprising, then, that text setting in the style of Benlœw, which I have associated with diegetic performance, is also used in other dramatic situations where characters are performing, preening, or otherwise showing off to other characters on stage. The text is set to the rhythm of a polonaise and features the same regular accentuation of alternate (even-numbered) syllables that we saw in the diegetic numbers above. This leads to an improper metrical emphasis on the e muet in the world “fille” in the second line. Thomas compounds the misaccentuation by further emphasizing this e muet with a melismatic flourish. This misaccentuation could easily have been avoided by adjusting the melismas and moving the first syllable of “fille” to the downbeat of the fourth measure. Philine is an actress, not a singer, and her showpiece is not heard as song by the other characters on stage, who are hearing instead Philine’s dramatic impersonation of the character of Titania. Even so, Thomas’s use of the bravura polonaise topic in this number emphasizes the fact that Philinie is an extroverted performer, and the text-setting style brings out the connection between Philine’s mode of performance and the diegetic performances discussed above. As in the diegetic numbers previously examined, in Philine’s polonaise the character is performing simultaneously to the characters on stage as well as to the audience in the theater, and the smaller performance is a mirror of the larger one. 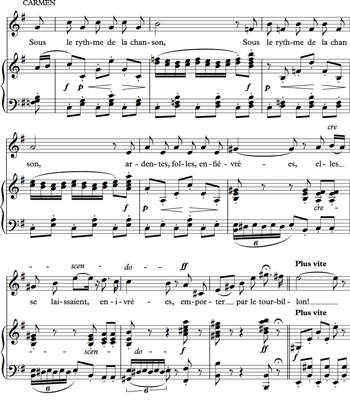 The text features alternating three- and six-syllable lines, and Bizet’s setting features alternating rhythms that correspond mostly to the accents in the text, but not completely. The three-syllable lines are all set as anapests that emphasize the line-ending tonic accents. The two six-syllable lines, on the other hand, are set as iambs in the style of Benlœw. This approach goes with the prosodic accents in the third line (“l’appel du tambourin”) but not with the prosodic accents in the sixth line (“la cymbale d’airain”). In particular, the strongest metrical emphasis in the last measure in Example 14 is placed on the e muet in “cymbale,” which really should be the weakest syllable in the line. The text setting draws our attention to the regular and recurrent rhythms underlying the diegetic dance taking place on stage. Using Castil-Blaze’s methods, we could no doubt bemoan along with him that “French opera [is] replete with examples of mistreated tonic accents” (Youens 2002, 489) and leave it at that. In light of our discussion of diegetic performance, however, I contend that there is a different, richer way of evaluating Boieldieu’s melody. In Boieldieu’s defense, his setting of the opening line—“Ah! quel plaisir d’être soldat!”—brings a highly appropriate quality of extroversion to the number. Unlike the numbers examined previously, Example 15 is not explicitly set up as a performance in the libretto: Georges does not turn to the chorus and say “let me sing (or act or dance) for you.” The dramatic context does indicate, however, that as a stranger introducing himself to a closed community and reassuring them that he means no harm, Georges is indeed performing to an onstage audience. 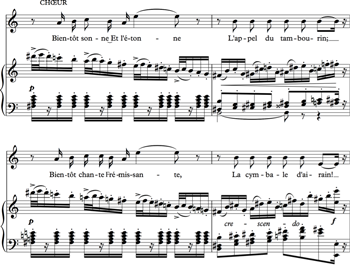 Boieldieu’s setting of the text in the manner of a diegetic number indicates that whether or not the chorus actually hears Georges’s air as music, they are almost certainly aware that he is giving a performance. Georges’s adoption of a popular melodic style may also indicate his simple and forthright character, or at least his desire to project that character to his onstage audience. Auber sets the pair of eight-syllable lines (the third and fourth lines above) to iambic dotted rhythms that regularly accentuate the even-numbered syllables, even though that goes against the declamation of the lines in at least two places. The verb “mène” is set to an iambic rhythm that improperly emphasizes the e muet. In the next line, the definite article in “la gloire” is accented, even though it should be the weakest syllable out of the three in the syntactic unit “et la gloire.”(39) Joli-Cœur’s aria is preceded by the line “Mars sut toujours plaire à Vénus” (Mars always knew how to please Venus), and the number is intended to be a seductive one directed towards winning the amorous favors of Térézine. Auber’s text setting emphasizes the performative aspect of seduction and Joli-Cœur’s status as a member of one of the “strutting, play-acting” armies typical of the time (Monelle 2006, 147). If the “Rossino-Gounodesque” lyrical style of Example 17 represents one principal mode of melodic discourse in Carmen, the diegetic performance style of what McClary calls the “song-and-dance number” represents the other. The juxtaposition of these styles is set up at the beginning of the opera. 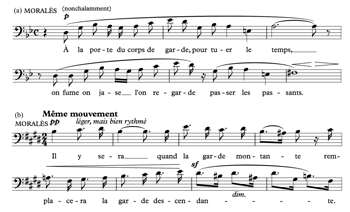 Example 18 contains two examples from the opening number of Carmen and illustrates Bizet’s blending of two different types of text setting to illustrate different dramatic situations within the same scene. 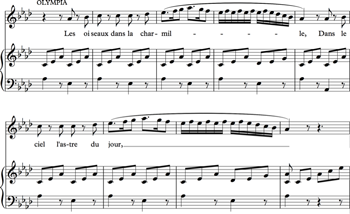 In Bizet’s setting, however, the march rhythm of the melody homogenizes the accents in the two verses, with the first verse sounding misaccentuated as a result: we get in Bizet’s setting “avec la garde montante,” with a wrongly emphasized e muet in the word garde (compare a similar misaccentuation of the same word in Example 18b and of “mène” in Example 16). The singsong quality of the declamation fits dramatically with the onstage performance being given by the children as they mimic the strutting soldiers. Bizet was generally quite meticulous about prosodic rhythm in the verses that he suggested to his librettists. (46) In spite of this, the first line of the refrain for the Habanera contains what Susan Youens has called a “classic example” of a “mistreated tonic accent” (2002, 489), namely, the metrical emphasis on the first syllable of the word “enfant” in the line “L’amour est enfant de Bohème” (Example 20). One reason for this mismatch between verse and melody may be that Bizet was simply thinking of another melody when he wrote the verses. Bizet’s friend Ernest Guiraud (who wrote the recitatives for the first Vienna production of Carmen after Bizet’s death) later claimed that Bizet went through thirteen versions of the Habanera before settling on Iradier’s melody (Lacombe 2000b, 653). If that were the case, however, presumably the librettists could have come up with new verses once Bizet settled on the final melody. The fitting of French verses to Spanish-style melodies was a common exercise in nineteenth-century France. This is illustrated in Example 21, which is taken from Échos d’Espagne, an anthology of Spanish songs published by Durand in 1872, a copy of which was in Bizet’s music library (Curtiss 1958, 472). Bizet and his librettists would surely have been able to do something similar for Iradier’s melody if they had wanted to. The explanation for the “mistreated tonic accents” in Example 20 must be that Bizet did not consider it necessary to remain faithful to prosodic rhythms in this diegetic number. In fact, Bizet’s practice of fitting his verses to Iradier’s existing melody without regard to prosodic accents is reminiscent of the vaudeville practices that formed the historical foundation for what I have called the diegetic style. Indeed, it is precisely the misaccentuation of words, including the e muet in the last line in Example 20 (“si je t’aime”), that emphasizes the diegetic character of the Habanera and Carmen’s persona as a performer. 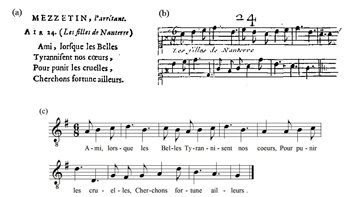 The obsessive eighth-note rhythm and regular accentuation of even-numbered syllables in the diegetic melody lead to the metrical emphasis of a succession of weak syllables in the line “sous le rythme de la chanson.” The rhythm actually fits the next line in the libretto rather well—“ardentes, folles, enfiévrées,” but as we have seen before, the differences in the internal prosodic rhythms of the lines are smoothed over and homogenized by the rhythm of the song. It is only with the last two lines of this final strophe (“elles se laissaient enivrées,” etc.) that Bizet finally adapts the rhythm of the melody to underline the sense of the text, at the climactic conclusion to Carmen’s reflexive narrative. From these accounts, one might expect Carmen’s final solo number, from the central section of the Card Scene, to reflect a consciously different melodic style than her “exotic” numbers from the first two acts. Bizet’s music, however, defies such simple categorizations. As with the Habanera, Bizet wrote the verses for the Air des cartes himself (Lacombe 2000b, 643–44). However, he did not consistently reflect the prosodic rhythms of his own verses in the melody of Example 23. In fact, Bizet’s text setting for this tragic and interior moment paradoxically reflects the same rhythmic qualities as Carmen’s earlier “song-and-dance” diegetic numbers, namely a simple alternation of strong and weak syllables in a way that sometimes goes with, and sometimes goes against, implied accents in the text. 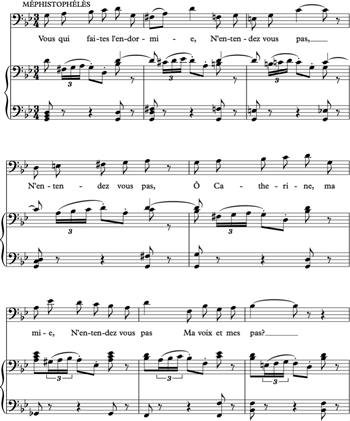 Indeed, the melody in straight eighth notes in triple meter, with its regular accentuation of even-numbered syllables, is very similar to the rhythmic character of the Chanson bohème. In the first, second, and fourth systems in Example 23, most of the prosodic accents in the text happen to fall on even-numbered syllables. The temps forts in the music and the syllabes fortes in the text (to use Benlœw’s terminology) thus mostly coincide and the resultant declamation is mostly unobjectionable, with the arguable exception of the accented first and third syllables in “réponses” in the second measure. In the third system of Example 23, however, all of the syllabes fortes in the text (other than the obligatory ones on the rhyme and the caesura) fall on odd-numbered syllables. Since the melodic rhythm remains inflexible, this results in a couple of misaccentuations: “le livre d’en haut,” with the e muet emphasized at the expense of the first syllable in “livre”; and “Mêle et coupe sans peur,” with the weakest syllable in the line, the e muet in “coupe,” placed in the strongest metrical position in the measure. Ralph Locke has commented on the rigid rhythmic pattern and the misaccentuations in Example 23, arguing that “the grim relentlessness of the Card Aria . . . renders [the] . . . unnatural declamation constricting, even dehumanizing” (2009, 172). Catherine Clément has similarly written that the number has “the rhythm of some inmost, penetrating curse” (1988, 52). Hugh Macdonald notes that Carmen “spells out the sombre verses in even syllables” (2014, 221). What many commentators have failed to notice, however, is that the rigid rhythmic patterns and misaccentuations of the Air des cartes do not actually represent a departure from Carmen’s earlier “carefree” music. In fact, the melody of Example 23 embodies many of the melodic and rhythmic characteristics that mark Carmen’s diegetic Spanish- or gypsy-style numbers from earlier in the opera. Notwithstanding the obvious differences in affect, Bizet’s music makes no clear melodic or rhythmic distinction between the “gypsy/exotic” discourse of Carmen’s earlier solo numbers and the supposedly “universal” style of discourse in the Card Scene. In light of my argument in this article, it may seem paradoxical that Carmen’s Air des cartes, which is neither diegetic nor directed at other onstage characters, nevertheless uses the same style of text setting as the other numbers discussed above. The observation is consistent, however, with the anti-metaphysical view of Carmen taken by Adorno and by Nietzsche before him. For Adorno, what is notable about the Card Scene (and Carmen as a whole) is that “there is an absence of transcendence and meaning” (1992, 61). Carmen thus calls into question the “Germanic (and Wagnerian) dichotomy between high metaphysical expression and kitsch” (Tomlinson 1999, 173n52). The text-setting style of Carmen’s monologue, with its privileging of musical rhythm over prosodic rhythm, supports this reading of the opera, suggesting that there is no fundamental dichotomy between the interior or “universal” Carmen of the Card Scene and the exterior song-and-dance persona of her diegetic performances. This in turn supports the Nietzschean hearing of Carmen outlined by Gary Tomlinson, in which the variety of musical styles exhibited by Carmen throughout the opera functions “not as a veil that Carmen draws in front of her essential subjectivity but as that subjectivity itself, in its truest form” (Tomlinson 1999, 125). By embracing the kinetic rhythms of diegetic song and dance and rejecting sentimentality even in the interior monologue of the Card Scene, Carmen effectively demonstrates her “Dionysian movement with and in the rhythms of life” (Tomlinson 1999, 124). This article began with Richard Strauss’s question: “Why do the French sing differently from the way they speak?” In response to this question, I have suggested that when characters in nineteenth-century French opera sing differently from the way they speak (most notably when they misaccentuate weak syllables like e muets), they are often engaging in diegetic or other kinds of onstage performance. In other words, they sing in different rhythms than those in which they would speak precisely because they are engaged in “singing as song,” and not “singing as speech.” Our examination of examples from the repertoire indicates that while there is empirical evidence that composers were generally sensitive to stress-meter alignment and just declamation in French vocal music (Temperley and Temperley 2013), there was nevertheless a rich tradition of setting melodies against tonic accents running from the precursors of the opéra comique through Grétry and Auber and on to Gounod and Bizet. 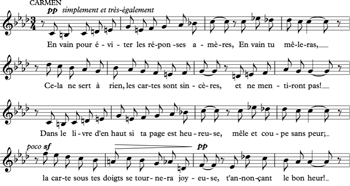 Carmen’s line from the Chanson bohème (Example 22)—“sous le rythme de la chanson” (under the rhythm of the song)—thus perfectly encapsulates the phenomenon discussed in this article: in French opera of the long nineteenth century, “proper” versification often succumbed to the hypnotic influence of the regular and repetitive rhythms of diegetic song, or dance and military topics. 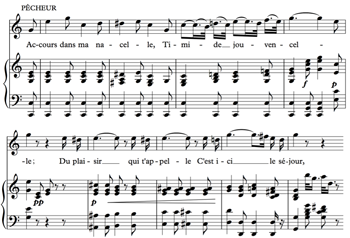 An understanding of this phenomenon enables us to better appreciate the way in which composers manipulated melody, rhythm, and text setting to illuminate dramatic situations in nineteenth-century French opera. Abbate, Carolyn. 1991. Unsung Voices: Opera and Musical Narrative in the Nineteenth Century. Princeton University Press. Adorno, Theodor W. 1992 . “Fantasia sopra Carmen.” In Quasi una Fantasia: Essays on Modern Music, translated by Rodney Livingstone, 53–64. Verso. Benlœw, Louis. 1862. Précis d’une théorie des rhythmes. A. Franck. Béranger, Pierre-Jean de. 1847. Musique des chansons de P.J. de Béranger, contenant les airs anciens et modernes plus usités. 4th ed. Perrotin. Bergeron, Katherine. 2010. Voice Lessons: French Mélodie in the Belle Époque. Oxford University Press. Buhler, James, David Neumeyer, and Rob Deemer. 2010. Hearing the Movies: Music and Sound in Film History. Oxford University Press. Castil-Blaze [François-Joseph-Henri Blaze]. 1858. L’art des vers lyriques. A. Delahays. Charlton, David. 1986. Grétry and the Growth of Opéra-Comique. Cambridge University Press. Clément, Catherine. 1988. Opera, or, The Undoing of Women. Translated by Betsy Wing. University of Minnesota Press. Cone, Edward T. 1989. “The World of Opera and Its Inhabitants.” In Music: A View from Delft. Selected Essays, ed. Robert P. Morgan, 125–38. University of Chicago Press. Curtiss, Mina. 1958. Bizet and His World. Secker & Warburg. Dahlhaus, Carl. 1985. Realism in Nineteenth-Century Music. Translated by Mary Whittall. Cambridge University Press. Ellis, Katharine. 2009. “Systems Failure in Operatic Paris: the Acid Test of the Théâtre-Lyrique.” In Music, Theater, and Cultural Transfer: Paris, 1830–1914, ed. Annegret Fauser and Mark Everist, 49–71. University of Chicago Press. Gallet, Louis. 1891. Notes d’un librettiste; Musique contemporaine. Calmann-Lévy. Giger, Andreas. 2008. Verdi and the French Aesthetic: Verse, Stanza, and Melody in Nineteenth-Century Opera. Cambridge University Press. Grétry, André-Ernest-Modeste. 1797. Mémoires, ou Essais sur la musique, vol. 1. L’Imprimerie de la République. Reprint, Da Capo Press, 1971. Grout, Donald Jay. 1939. “The Origins of the Opéra Comique.” PhD diss., Harvard University. Huebner, Steven. 1990. The Operas of Charles Gounod. Clarendon Press. Huebner, Steven. 1993. “Carmen as Corrida de Toros.” Journal of Musicological Research 13: 3–29. —————. 1993. “Carmen as Corrida de Toros.” Journal of Musicological Research 13: 3–29. Indy, Vincent d’. 1950. Cours de composition musicale, vol. 3. Durand. Isherwood, Robert M. 1978. “Popular Musical Entertainment in Eighteenth-Century Paris.” International Review of the Aesthetics and Sociology of Music 9 (2): 295–310. Lacombe, Hervé. 2000a. “L’Espagne à l’Opéra-Comique avant Carmen: Du Guitarrero de Halévy (1841) à Don César de Bazan de Massenet (1872).” In Échanges musicaux franco-espagnols, XVIIe-XIXe siècles: Actes des Rencontres de Villecroze, 15 au 17 octobre 1998, ed. François Lesure, 161–93. Klincksieck. Lacombe, Hervé. 2000b. Georges Bizet: Naissance d’une identité créatrice. Fayard. —————. 2000b. Georges Bizet: Naissance d’une identité créatrice. Fayard. Lacome, P[aul], and J. Puig y Alsubide, eds. 1872. Échos d’Espagne: Chansons et danses populaires. Durand. Laparra, Raoul. 1935. Bizet et l’Espagne. Delagrave. Le Sage, Alain-René, and Jacques-Philippe d’Orneval. 1737. Le Théâtre de la Foire, ou l’Opéra-Comique, vol. 2. Gandouin. Lindenberger, Herbert. 1984. Opera: The Extravagant Art. Cornell University Press. Lippmann, Friedrich. 1973–75. “Der italienische Vers und der musikalische Rhythmus. Zum Verhältnis von Vers und Musik in der italienischen Oper des 19. Jahrhunderts, mit einem Rückblick auf die 2. Hälfte des 18. Jahrhunderts.” 3 parts. Analecta musicologica 12: 253–369 (Part 1); Analecta musicologica 14: 324–410 (Part 2); Analecta musicologica 15: 298–333 (Part 3). Locke, Ralph. 2009. Musical Exoticism: Images and Reflections. Cambridge University Press. Lussy, Mathis. 1874. Traité de l’expression musicale: Accents, nuances et mouvements dans la musique vocale et instrumentale. Heugel. Macdonald, Hugh. 1989. “The Prose Libretto.” Cambridge Opera Journal 1 (2): 155–66. Macdonald, Hugh. 2014. Bizet. Oxford University Press. —————. 2014. Bizet. Oxford University Press. McClary, Susan. 1992. Georges Bizet: Carmen. Cambridge University Press. McClary, Susan. 1997. “Structures of Identity and Difference in Bizet’s Carmen.” In The Work of Opera: Genre, Nationhood, and Sexual Difference, ed. Richard Dellamora and Daniel Fischlin, 115–29. Columbia University Press. —————. 1997. “Structures of Identity and Difference in Bizet’s Carmen.” In The Work of Opera: Genre, Nationhood, and Sexual Difference, ed. Richard Dellamora and Daniel Fischlin, 115–29. Columbia University Press. Monelle, Raymond. 2006. The Musical Topic: Hunt, Military and Pastoral. Indiana University Press. Moreen, Robert. 1975. “Integration of Text Forms and Musical Forms in Verdi’s Early Operas.” PhD diss., Princeton University. Murphy, Kerry. 2009. “Carmen: Couleur Locale or the Real Thing?” In Music, Theater, and Cultural Transfer: Paris, 1830–1914, ed. Annegret Fauser and Mark Everist, 293–315. University of Chicago Press. Parakilas, James. 1998. “How Spain Got a Soul.” In The Exotic in Western Music, ed. Jonathan Bellman, 137–93. Northeastern University Press. Quicherat, Louis-Marie. 1850. Traité de versification française, où sont exposées les variations successives des règles de notre poésie et les functions de l’accent tonique dans les vers français. 2nd ed. Hachette. Reicha, Antoine. 1833. Art du compositeur dramatique, ou Cours complet de composition vocale, divisé en quatre parties et accompagné d’un volume de planches, 2 vols. Richault. Saint-Saëns, Camille. 1885. Harmonie et mélodie. Calmann-Lévy. Scoppa, Antonio. 1811. Les vrais principes de la versification, dévélopées par un examen comparatif entre la langue italienne et la française, vol. 1. Courcier. Scott, Clive. 1980. French Verse-art: A Study. Cambridge University Press. Scribe, Eugène. 1835. Théâtre complet, vol. 14. Aimé André. Soubies, Albert. 1894. Soixante-neuf ans à l’Opéra-Comique en deux pages: De la première de “La Dame blanche” à la millième de “Mignon.” Fischbacher. Strauss, Richard, and Romain Rolland. 1968. Correspondence. Edited by Rollo H. Myers. Calder & Boyars. Temperley, Nicholas, and David Temperley. 2013. “Stress-Meter Alignment in French Vocal Music.” Journal of the Acoustical Society of America, 134 (1): 520–27. Tomlinson, Gary. 1999. Metaphysical Song: An Essay on Opera. Princeton University Press. Wright, Lesley. 1981. “Bizet Before Carmen.” PhD diss., Princeton University. Youens, Susan. 2002. “Words and Music in Germany and France.” In The Cambridge History of Nineteenth-Century Music, ed. Jim Samson, 460–99. Cambridge University Press. Zoppelli, Luca. 1990. “‘Stage Music’ in Early Nineteenth-Century Italian Opera.” Translated by Arthur Groos and Roger Parker. Cambridge Opera Journal 2 (1): 29–39. 1. I am indebted to Carl Schachter for referring me to this volume of correspondence. 3. The summary below draws primarily on Quicherat 1850, 1–19 (syllable counting), 133–41 (placement of accents), and 177–205 (verses with various numbers of syllables). According to Andreas Giger, Quicherat’s treatise was “one of the most frequently cited nineteenth-century versification manuals” (2008, 230). For a comprehensive list of other significant French versification treatises written between 1787 and 1912, see Giger 2008, 229–31. For a more detailed discussion of theories of French versification, see Giger 2008, 7–17. 4. In traditional French verse, the e muet is the only word-ending vowel that can be elided into a vowel at the beginning of the next word. The combination of any other adjacent vowel sounds between successive words, as in the words “tu as,” is known as a “hiatus” and is forbidden under traditional rules of French versification. See Quicherat 1850, 51. 5. Not all theorists agreed on the proper placement of caesuras. Nineteenth-century poets and librettists often experimented with different ways of dividing verses. See Giger 2008, 17–18. 6. See Scott 1980, 129–36. Quicherat (1850, 72–83) has a slightly different classification system that excludes rimes embrassées but includes rimes mêlées (mixed alternations of a and b) and rimes redoublées (use of the same rhyme more than twice in a single scheme). 7. See Quicherat 1850, 12. Giger notes that while there was general agreement on this principle, “not all [nineteenth-century] theorists adopted this view without qualification” (2008, 9). 8. Giger (2008, 10) notes that nineteenth-century theorists of versification had four basic approaches to the issue of accents beyond the ones on rhyme and caesura: (1) avoiding the issue, (2) discerning regular patterns of metric feet, (3) observing a set number of accents per verse, and (4) observing irregular rhythmic groups, defined by syntax and sense. Quicherat’s treatise adopts the third of these approaches. 9. A table summarizing Quicherat’s rules regarding the number and placement of accents within verses with different syllable counts can be found in Giger 2008, 13 (Table 1.1). 10. “la langue française a un accent et un rhythme qui doivent répondre exactement au rhythme musical; et . . . dans les vers on peut considérer les pieds rhythmiques comme une petite césure qui toujours doit rencontrer une bonne note.” These statements appeared in a letter from Grétry that served as a preface to a versification treatise by Antonio Scoppa. All translations in this article are mine unless otherwise noted. 12. “On distingue en musique les syllabes longues des syllabes brèves par la place qu’elles occupent dans la musique [emphasis in original].” In his treatise, Reicha describes accented and unaccented syllables as “long” and “short”—terms derived from the durational accents of classical Greek and Latin poetry—rather than “strong” and “weak.” Giger notes that unlike Reicha, “in mid-nineteenth century France, the leading theorists emphasized stress over [durational] quantity” (2008, 9). I have followed the latter practice in this article. 14. Example 2 is included in the volume of examples that accompanies Reicha’s treatise (1833, vol. 2, 28, ex. 62). 15. Richard continued to be immensely popular throughout the nineteenth century, notching up 302 performances at the Théâtre-Lyrique in Paris between 1851 and 1870. This made it the second-most-performed work at that theater, after Gounod’s Faust (Ellis 2009, 55). Richard also received 83 performances between 1873 and 1876 at the Opéra-Comique, including 29 performances in 1875, the year of the premiere of Bizet’s Carmen at the same theater (Soubies 1894). It thus represented a living tradition for the later composers discussed in this article. 17. The critic and librettist Castil-Blaze characteristically took it upon himself to provide regularized verses to better fit the rhythms of Grétry’s music: “Je sus, mon bien suprême | Mon roi, mon doux sauveur!” (1858, 71). 18. In film studies, “diegetic sound refers to everything that can be heard by characters in the film” (Buhler, Neumeyer, and Deemer 2010, 66). Diegetic music in films is sometimes called “source music.” Abbate loosely defines “phenomenal” performance as “a musical or vocal performance that declares itself openly, singing that is heard by its singer, the auditors on stage, and understood as ‘music that they (too) hear’ by us, the theater audience” (1991, 5). Other terms for the same phenomenon in opera include “literal” song (Lindenberger 1984, 85), “realistic” song (Cone 1989, 128), “real” or “onstage” music (Dahlhaus 1985, 90), and “stage music” (Zoppelli 1990). 22. Example 5a is reproduced from Le Sage and Orneval 1737, vol. 2, 86. Example 5b is reproduced from Le Sage and Orneval 1737, vol. 2, “Table des Airs,” 6. The tune of Example 5b is adapted to different sets of verses in four different plays in the same volume. Example 5c is based on a transcription in Grout 1939, 347. 23. See note 20 and the accompanying text above. 24. In Table 1, I have collapsed Grout’s chansons and vaudevilles into a single category. I have also used the term air in Grout’s narrow sense of a number that is faithful to prosodic rhythms, while recognizing that the term was frequently used to refer in a broad sense to any musical number, as in Example 5a. 25. There are three types of line endings in Italian verse: tronco (ending on an accented syllable), piano (ending on an unaccented syllable following the last accented syllable), and sdrucciolo (ending on two unaccented syllables following the last accented syllable). Syllable counts in Italian verse are based on the piano ending (see, e.g., the first and third lines in the Donizetti barcarolle). For a summary of the rules of Italian versification, see Moreen 1975, 1–26. For a discussion of characteristic musical settings of different types of Italian verses, see Lippmann 1973–75. 26. I am grateful to the anonymous reviewer who referred me to this example. The Italian version of the same number begins with the following settenari: “Deh vieni, o mia diletta, | In sen di mia barchetta.” Note the regularly spaced prosodic accents on the second and sixth syllables in both the French and Italian lines. 28. Katherine Bergeron has noted that as late as 1891, Paul Verlaine employed singsong rhythms in a satirical sonnet to evoke “the spirit of populism—and anarchy—associated with Montmartre’s café culture” (2010, 122). 29. The line is from the libretto to Joconde (1814), an opéra comique by Nicolas Isouard (1773–1818), known as Nicolò. 30. The line is from the Idylles of Antoinette Deshoulières (1638–1694). 32. This passage from Benlœw’s treatise is discussed in Giger 2008, 10–11. The ensuing discussion of Béranger’s setting (Example 9) is my own. 33. Benlœw’s syllabes fortes (like Reicha’s syllabes logiques) are driven by context. The issue is thus not whether a word like lui can be a syllabe forte in the abstract, but whether it constitutes a syllabe forte in the context of the given line. As noted above in paragraph , prosodic accents in French verses generally default to the end of syntactic units. Thus, in Benlœw’s annotation of the declaimed version of Béranger’s lines, lui is labeled as a syllabe forte in the first line (where it constitutes the strong final syllable of the syntactic unit “devant lui”) but not in the second line (where it constitutes a weak intermediate syllable in the syntactic unit “sans lui demander”). 34. 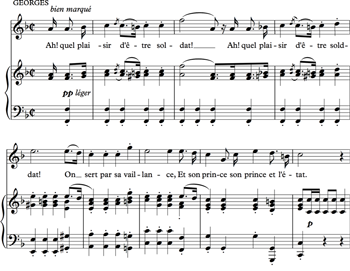 The practice of setting an unaccented syllable at the beginning of the line to a strong beat (as in Example 9) is a common one in both French and Italian opera. See, e.g., Moreen 1975, 23. 35. “M. Gounod . . . nous [a] ramenés vers la grande tradition du passé, en basant sa musique vocale sur la justesse de la déclamation.” See also Huebner 1990, 228 (“at his best moments Gounod approached melody from a different perspective from French composers of the preceding generation”). 36. Luca Zoppelli has suggested that “the mimetic presence of stage music wrenches [the spectators] from their position as outside observers and induces them to see with the eyes of the character, to identify with his or her reactions” (1990, 33). 37. The “song” referred to in the quoted passage is Raimbaut’s ballade from Meyerbeer’s Robert le diable. See note 21 above. 40. The division in melodic styles is not as clear as McClary makes it out to be, since Don José also has a diegetic number in the opera, the off-stage Chanson in Act II (“Halte là! Qui va là?”). 41. 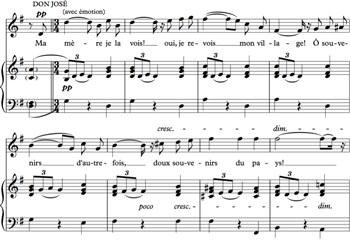 Note that Bizet smooths out the prosody in this non-diegetic number by inserting two extra syllables (“oui” and “Ô”) to the librettists’ verses. Contrast that with the diegetic Example 11, in which Halévy distorts the prosody by inserting an extra syllable (“Ô”). 43. James Parakilas has noted that one of the enduring Spanish character types in nineteenth-century France was that of “the Spanish dancer, above all the female Spanish dancer, evoked by music that plays on the rhythm of one or another of the famous Spanish dance types” (1998, 141). For other discussions of the construction of Spain in nineteenth-century France, see Lacombe 2000a and Murphy 2009. 45. Bizet’s original verses for the refrain ended with the line “si je t’aime, tant pis à toi!” (if I love you, too bad for you!) instead of “prends garde à toi!” (watch out!). See Lacombe 2000b, 642. 46. According to Louis Gallet (1891, 78), the librettist for Bizet’s Djamileh (1872), Bizet often composed melodies with specific prosodic rhythms in mind, making up his own model or mock-up verses that could later be altered or refined by a librettist. Bizet’s correspondence with Gallet in 1873 concerning Don Rodrigue, a project for the Paris Opéra that was never completed, contains numerous references to Bizet’s use of these mock-up verses, which were familiarly called monstres. There is no surviving record of any extensive correspondence between Bizet and the librettists for Carmen similar to the Bizet-Gallet correspondence for Don Rodrigue. Lesley Wright (1981, 13) speculates that this was because Bizet and Carmen’s librettists Meilhac and Halévy all lived in Paris and could easily have met to discuss details of the project in person. 47. For other statements in the same vein, see, e.g., Huebner 1993, 9 and Parakilas 1998, 161. I am indebted to Carl Schachter for referring me to this volume of correspondence. The summary below draws primarily on Quicherat 1850, 1–19 (syllable counting), 133–41 (placement of accents), and 177–205 (verses with various numbers of syllables). According to Andreas Giger, Quicherat’s treatise was “one of the most frequently cited nineteenth-century versification manuals” (2008, 230). For a comprehensive list of other significant French versification treatises written between 1787 and 1912, see Giger 2008, 229–31. For a more detailed discussion of theories of French versification, see Giger 2008, 7–17. In traditional French verse, the e muet is the only word-ending vowel that can be elided into a vowel at the beginning of the next word. The combination of any other adjacent vowel sounds between successive words, as in the words “tu as,” is known as a “hiatus” and is forbidden under traditional rules of French versification. See Quicherat 1850, 51. Not all theorists agreed on the proper placement of caesuras. Nineteenth-century poets and librettists often experimented with different ways of dividing verses. See Giger 2008, 17–18. See Scott 1980, 129–36. Quicherat (1850, 72–83) has a slightly different classification system that excludes rimes embrassées but includes rimes mêlées (mixed alternations of a and b) and rimes redoublées (use of the same rhyme more than twice in a single scheme). See Quicherat 1850, 12. Giger notes that while there was general agreement on this principle, “not all [nineteenth-century] theorists adopted this view without qualification” (2008, 9). Giger (2008, 10) notes that nineteenth-century theorists of versification had four basic approaches to the issue of accents beyond the ones on rhyme and caesura: (1) avoiding the issue, (2) discerning regular patterns of metric feet, (3) observing a set number of accents per verse, and (4) observing irregular rhythmic groups, defined by syntax and sense. Quicherat’s treatise adopts the third of these approaches. A table summarizing Quicherat’s rules regarding the number and placement of accents within verses with different syllable counts can be found in Giger 2008, 13 (Table 1.1). “la langue française a un accent et un rhythme qui doivent répondre exactement au rhythme musical; et . . . dans les vers on peut considérer les pieds rhythmiques comme une petite césure qui toujours doit rencontrer une bonne note.” These statements appeared in a letter from Grétry that served as a preface to a versification treatise by Antonio Scoppa. All translations in this article are mine unless otherwise noted. “On distingue en musique les syllabes longues des syllabes brèves par la place qu’elles occupent dans la musique [emphasis in original].” In his treatise, Reicha describes accented and unaccented syllables as “long” and “short”—terms derived from the durational accents of classical Greek and Latin poetry—rather than “strong” and “weak.” Giger notes that unlike Reicha, “in mid-nineteenth century France, the leading theorists emphasized stress over [durational] quantity” (2008, 9). I have followed the latter practice in this article. Example 2 is included in the volume of examples that accompanies Reicha’s treatise (1833, vol. 2, 28, ex. 62). Richard continued to be immensely popular throughout the nineteenth century, notching up 302 performances at the Théâtre-Lyrique in Paris between 1851 and 1870. This made it the second-most-performed work at that theater, after Gounod’s Faust (Ellis 2009, 55). Richard also received 83 performances between 1873 and 1876 at the Opéra-Comique, including 29 performances in 1875, the year of the premiere of Bizet’s Carmen at the same theater (Soubies 1894). It thus represented a living tradition for the later composers discussed in this article. The critic and librettist Castil-Blaze characteristically took it upon himself to provide regularized verses to better fit the rhythms of Grétry’s music: “Je sus, mon bien suprême | Mon roi, mon doux sauveur!” (1858, 71). In film studies, “diegetic sound refers to everything that can be heard by characters in the film” (Buhler, Neumeyer, and Deemer 2010, 66). Diegetic music in films is sometimes called “source music.” Abbate loosely defines “phenomenal” performance as “a musical or vocal performance that declares itself openly, singing that is heard by its singer, the auditors on stage, and understood as ‘music that they (too) hear’ by us, the theater audience” (1991, 5). Other terms for the same phenomenon in opera include “literal” song (Lindenberger 1984, 85), “realistic” song (Cone 1989, 128), “real” or “onstage” music (Dahlhaus 1985, 90), and “stage music” (Zoppelli 1990). Example 5a is reproduced from Le Sage and Orneval 1737, vol. 2, 86. Example 5b is reproduced from Le Sage and Orneval 1737, vol. 2, “Table des Airs,” 6. The tune of Example 5b is adapted to different sets of verses in four different plays in the same volume. Example 5c is based on a transcription in Grout 1939, 347. See note 20 and the accompanying text above. In Table 1, I have collapsed Grout’s chansons and vaudevilles into a single category. I have also used the term air in Grout’s narrow sense of a number that is faithful to prosodic rhythms, while recognizing that the term was frequently used to refer in a broad sense to any musical number, as in Example 5a. There are three types of line endings in Italian verse: tronco (ending on an accented syllable), piano (ending on an unaccented syllable following the last accented syllable), and sdrucciolo (ending on two unaccented syllables following the last accented syllable). Syllable counts in Italian verse are based on the piano ending (see, e.g., the first and third lines in the Donizetti barcarolle). For a summary of the rules of Italian versification, see Moreen 1975, 1–26. For a discussion of characteristic musical settings of different types of Italian verses, see Lippmann 1973–75. I am grateful to the anonymous reviewer who referred me to this example. 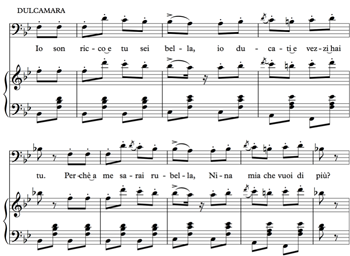 The Italian version of the same number begins with the following settenari: “Deh vieni, o mia diletta, | In sen di mia barchetta.” Note the regularly spaced prosodic accents on the second and sixth syllables in both the French and Italian lines. Katherine Bergeron has noted that as late as 1891, Paul Verlaine employed singsong rhythms in a satirical sonnet to evoke “the spirit of populism—and anarchy—associated with Montmartre’s café culture” (2010, 122). The line is from the libretto to Joconde (1814), an opéra comique by Nicolas Isouard (1773–1818), known as Nicolò. The line is from the Idylles of Antoinette Deshoulières (1638–1694). This passage from Benlœw’s treatise is discussed in Giger 2008, 10–11. The ensuing discussion of Béranger’s setting (Example 9) is my own. Benlœw’s syllabes fortes (like Reicha’s syllabes logiques) are driven by context. The issue is thus not whether a word like lui can be a syllabe forte in the abstract, but whether it constitutes a syllabe forte in the context of the given line. As noted above in paragraph , prosodic accents in French verses generally default to the end of syntactic units. Thus, in Benlœw’s annotation of the declaimed version of Béranger’s lines, lui is labeled as a syllabe forte in the first line (where it constitutes the strong final syllable of the syntactic unit “devant lui”) but not in the second line (where it constitutes a weak intermediate syllable in the syntactic unit “sans lui demander”). 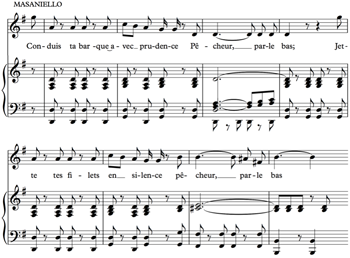 The practice of setting an unaccented syllable at the beginning of the line to a strong beat (as in Example 9) is a common one in both French and Italian opera. See, e.g., Moreen 1975, 23. “M. Gounod . . . nous [a] ramenés vers la grande tradition du passé, en basant sa musique vocale sur la justesse de la déclamation.” See also Huebner 1990, 228 (“at his best moments Gounod approached melody from a different perspective from French composers of the preceding generation”). Luca Zoppelli has suggested that “the mimetic presence of stage music wrenches [the spectators] from their position as outside observers and induces them to see with the eyes of the character, to identify with his or her reactions” (1990, 33). The “song” referred to in the quoted passage is Raimbaut’s ballade from Meyerbeer’s Robert le diable. See note 21 above. The division in melodic styles is not as clear as McClary makes it out to be, since Don José also has a diegetic number in the opera, the off-stage Chanson in Act II (“Halte là! Qui va là?”). 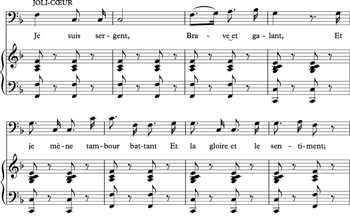 Note that Bizet smooths out the prosody in this non-diegetic number by inserting two extra syllables (“oui” and “Ô”) to the librettists’ verses. Contrast that with the diegetic Example 11, in which Halévy distorts the prosody by inserting an extra syllable (“Ô”). James Parakilas has noted that one of the enduring Spanish character types in nineteenth-century France was that of “the Spanish dancer, above all the female Spanish dancer, evoked by music that plays on the rhythm of one or another of the famous Spanish dance types” (1998, 141). For other discussions of the construction of Spain in nineteenth-century France, see Lacombe 2000a and Murphy 2009. Bizet’s original verses for the refrain ended with the line “si je t’aime, tant pis à toi!” (if I love you, too bad for you!) instead of “prends garde à toi!” (watch out!). See Lacombe 2000b, 642. According to Louis Gallet (1891, 78), the librettist for Bizet’s Djamileh (1872), Bizet often composed melodies with specific prosodic rhythms in mind, making up his own model or mock-up verses that could later be altered or refined by a librettist. Bizet’s correspondence with Gallet in 1873 concerning Don Rodrigue, a project for the Paris Opéra that was never completed, contains numerous references to Bizet’s use of these mock-up verses, which were familiarly called monstres. There is no surviving record of any extensive correspondence between Bizet and the librettists for Carmen similar to the Bizet-Gallet correspondence for Don Rodrigue. Lesley Wright (1981, 13) speculates that this was because Bizet and Carmen’s librettists Meilhac and Halévy all lived in Paris and could easily have met to discuss details of the project in person. For other statements in the same vein, see, e.g., Huebner 1993, 9 and Parakilas 1998, 161.